Many new agents to Real Estate never develop an eye towards ‘Property Values’ because they have failed to learn the skill of Previewing Listings. New Agents must add to their weekly to-do list the task of physically Previewing Listings; no, not on the computer, but in person. 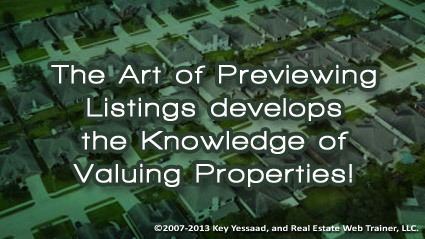 Learning the value of properties in your market area is an important skill that customers value, and I have come across many in my trainings who make up numbers and pretend they know – when they truly don’t know! Our Brokers must put all our agents on a regiment that requires the development of such a fundamental skill, both Buyers’ Agents and Sellers’ Agents. The value of your agents is in the advice they give customers based on sound fundamentals and grounded knowledge; push them to acquire these skills – they may not thank you now; but they will do so in the long run!